People say that it isÂ some kind of Steve Jobs special sauce that makes Apple the company that it is,Â but as this Fortune article reveals, they reap rewards from using design techniques that we all have access to, and should *all* be doing. All the time. “One of the best pieces of advice Mickey ever gave us was to go rent a warehouse and build a prototype of a store, and not, you know, just design it, go build 20 of them, then discover it didn’t work,” says Jobs. In other words, design it as you would a product. Apple Store Version 0.0 took shape in a warehouse near the Apple campus. “Ron and I had a store all designed,” says Jobs, when they were stopped by an insight: The computer was evolving from a simple productivity tool to a “hub” for video, photography, music, information, and so forth. The sale, then, was less about the machine than what you could do with it. But looking at their store, they winced. The hardware was laid out by product category – in other words, by how the company was organized internally, not by how a customer might actually want to buy things. “We were like, ‘Oh, God, we’re screwed! '” says Jobs. 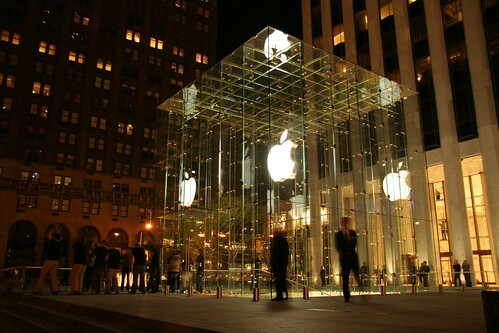 Both of these techniques have been key in helping Apple make more dollars per square foot than stores like Saks or Tiffany – a pretty successful outcome by any measure, not to mention the way that the experience of the Apple store contributes to the over all Apple brand equity. WWAD? Prototyping and user research. Go crazy. Is that photo of the Apple Store on Regent street? Nope, this one is 5th Ave in New York City. Pingback:	Design de InteraÃ§Ã£o » Blog Archive » WWAD?